On Sunday, May 13, 2018 at least 13 people were killed in bomb attacks on three churches, in Indonesia. 38 were people wounded in the attacks. A suicide attack targeted the Catholic church of St. Mary Immaculate. While, a few minutes later, another explosion occurred at the building of the Christian Church of Indonesia (Gki). The last explosion occurred at the Pentecostal church of Jalan Arjuna. A fourth attack on the cathedral of the Sacred Heart of Jesus was prevented by the police. > The series of explosions that took place around 7 am this morning in three different churches in Surabaya, the capital of the East Java province. Wisnu Sakti Buana, deputy mayor of the city, said the police arrested one of the bombers, who was about to attack the fourth target, the Cathedral of the Sacred Heart of Jesus. One suicide attack hit the Catholic church of St. Mary Immaculate in the district of Ngagel. The bomb exploded at the entrance of the parish before the 7.30 mass, while faithful were entering the church. In an initial death toll, a parishioner, a policeman and the bomber died; at least 13 people were injured. 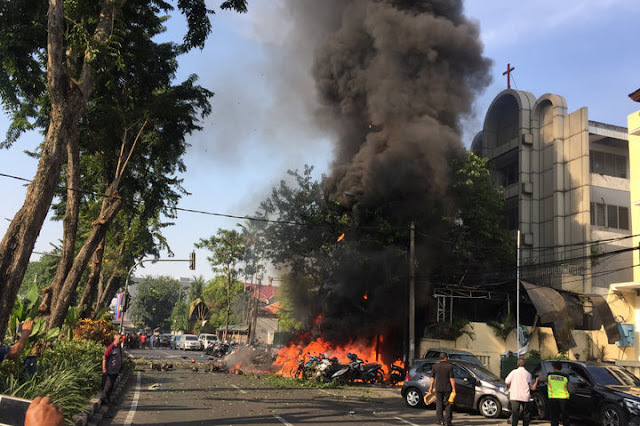 A few minutes later, another explosion occurred at the Diponegoro building of the Christian Church of Indonesia (Gki), also in the centre of Surabaya, where two people died. Within a few minutes, another bomb exploded at the Pentecostal church of Jalan Arjuna, causing the death of one person. Chief Inspector of the East Java Police, Machfud Arifin, said that according to preliminary investigations the attacks were carried out by suicide bombers who used motorcycles or cars separately. BBC reports, one family was responsible, the mother and two daughters, ages 9 and 12, blew themselves up at a church, while the father and two sons targeted two others, according to police. In Indonesia, the most populous Islamic country in the world, Christians represent about 10% of the population. Protestants are 17 million, 7 million Catholics (3% of Indonesians). They are often targets of extremists and terrorists' threats. On Christmas Eve 2000, bomb attacks on 11 churches scattered across the country killing 13 people and wounded 100. On July 22, 2001, in the parish of St. Anna in Duren Sawit (East Jakarta), a bomb caused five dead and injured a dozen. Please pray for the Persecuted Church I try to remember them, one Psalm that I recite for them as well as Police and the people of Israel is Psalm 91.